Taman Budaya is a kind of space for artists to express or perform their arts skills, especially West Java traditional arts. 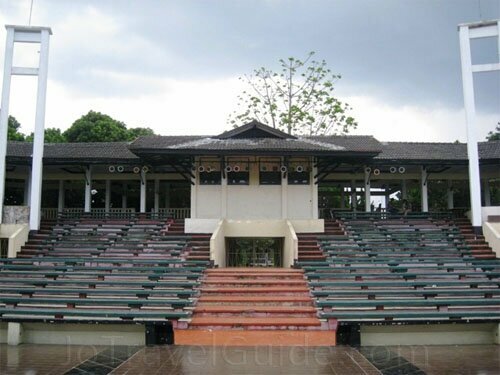 The government of West Java purposely built Taman Budaya to protect and perpetuate traditional and contemporary arts, either from West Java or other places in Indonesia. Many foreign tourists and domestic enjoy traditional art performances in Taman Budaya. Click the picture above for more and bigger photos of Taman Budaya. Taman Budaya has also a workshop for tourists to learning more about gamelan, piano, pencak silat (an Indonesian traditional martial art), and so on. Schedules need to be confirmed with Taman Budaya management. An indoor theater here is usually used for indoor art performances and the other art shows. Remarks : Taman Budaya usually programs its all-year-around events one year ahead. For instance, you can see Banjidoran performance (a traditional art from Karawang and Subang) and fireworks every the end of the year. 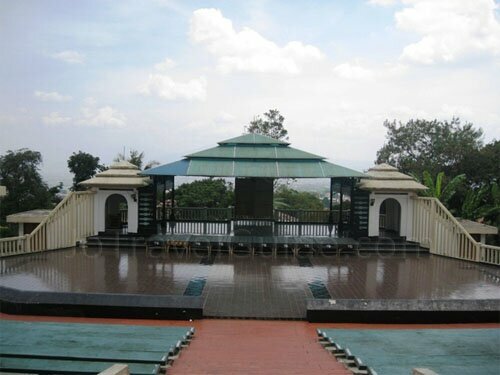 Taman Budaya normally looks empty if there is no activities. For schedule of arts performances, please call the phone number above. Lingkung Seni Daya Sunda is a place to watch art and cultural performances, which is located in Kebon Binatang Bandung (Taman Sari zoo) area. Lingkung Seni Daya Sunda is established by the West Java Department of Tourism and Culture and aims to develop and preserve Sundanese traditional arts, such as Ketuk Tilu dance, gamelan and Pencak Silat (a martial art that is originated from West Java). Usually, the traditional art show will be performed by an average of 20 artists. Ketuk Tilu dance is held on every first, second, and third Sunday of the month, while Pencak Silat is held on every fourth Sunday of the month. Remarks : this place shows traditional arts performances, such as gamelan, wayang golek, jaipongan and Ketuk Tilu dance by special request, 3 weeks in advance. It is advisable to call Mr. Ahim Sulaiman (official staff) on a phone number above to check for the time schedules.